The silhouette-style target not doing it for you? Then, forget it. 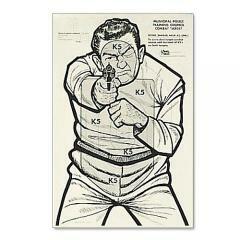 KleenBore has designed the K5 Bad Guy Paper Target to bring to light what one may see in the line of duty. The K5 Target is printed on paper and features a perpetrator poised and aiming a firearm directly at an arresting officer. Specific target zones are marked on the perp's body in order to accurately assess one's practice hits. KleenBore's targets measure 23 x 35-inches, delivering a lifelike training experience at the range. The targets come in packs of 100 for reliable and extended marksmanship practice.